var brightcoveBrandsafety='4 Sport and specialist news – passed for ad targeting' Experts from Israel created the world’s first 3D vascularised engineered heart which could be a huge step towards beating heart disease. The experts took cells from the patient, and used them to create the heart in order to minimise complications. Lead author Professor Tal Dvir of Tel Aviv University’ School of Molecular Cell Biology and Biotechnology, said: “This is the first time anyone anywhere has successfully engineered and printed an entire heart replete with cells, blood vessels, ventricles and chambers.” Related articles Heart attack: Lumps on your skin you shouldn’t ignore Best supplements for the heart: Spice proven to boost heart health Heart and circulatory disease causes 26 percent of all deaths in the UK, and the waiting list for surgery is extremely lengthy. The medical breakthrough, as reported in the journal Advanced Science, could therefore help reduce the waiting list and save millions of lives worldwide as there will be no wait for a donor.During the research, scientists took fatty tissues from patients, and then separated the cellular and a-cellular materials of the tissue. The differentiated cells were then mixed with a customised printing material, made from extracellular macromolecules such as collagen and glycoproteins and catered to the patient’s biology.First WORKING 3D printed heart CREATED and could save MILLIONS of lives (Image: AFP • GETTY) "This heart is made from human cells and patient-specific biological materials. "Dr DvirDr Dvir said: “This heart is made from human cells and patient-specific biological materials. In our process, these materials serve as the bio-inks, substances made of sugars and proteins that can be used for 3D printing of complex tissue models.“People have managed to 3D-print the structure of a heart in the past, but not with cells or with blood vessels. 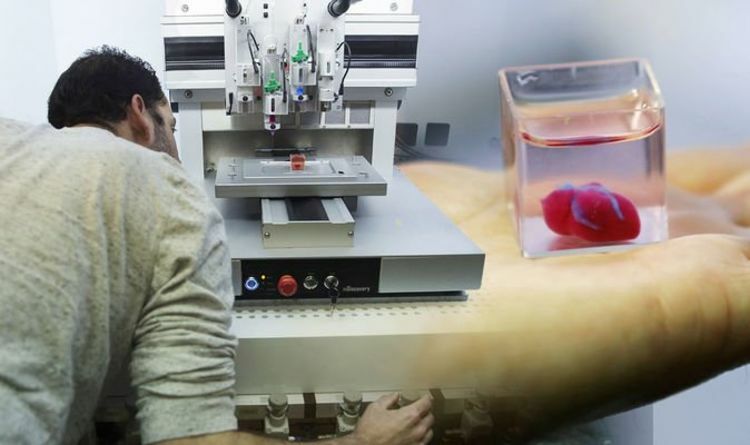 “Our results demonstrate the potential of our approach for engineering personalised tissue and organ replacement in the future.”“At this stage, our 3D heart is small, the size of a rabbit’s heart.The heart "is small, the size of a rabbit’s heart." (Image: AFP • GETTY) var brightcoveBrandsafety='4 Sport and specialist news – passed for ad targeting' “The biocompatibility of engineered materials is crucial to eliminating the risk of implant rejection, which jeopardises the success of such treatments. “Ideally, the biomaterial should possess the same biochemical, mechanical and topographical properties of the patient’s own tissues.“Here, we can report a simple approach to 3D-print thick, vascularised and perfusable [that blood can be pushed through vessels) cardiac tissues that completely match the immunological, cellular, biochemical and anatomical properties of the patient.